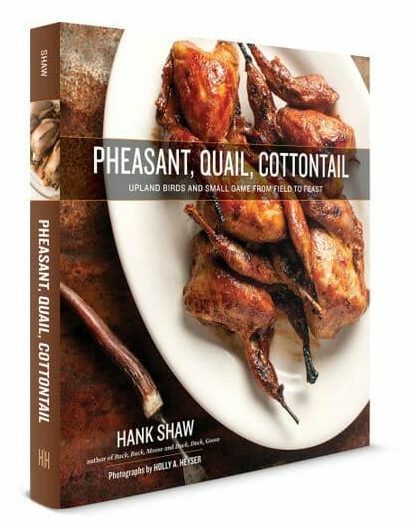 This is a lovely, simple recipe for roast chukar; Hungarian partridges would work fine, too — as would a domestic Cornish game hen. 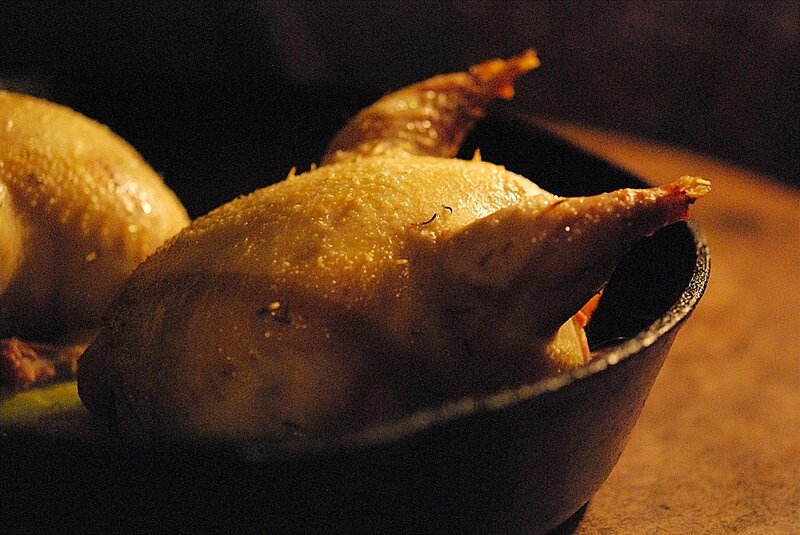 Partridges are in many ways little pheasants, with a flavor closer to chicken than their cousins the grouse. Also like chicken, chukars can get dry in a hurry. That’s why I advise brining the birds overnight before roasting. It will give you a lot of wiggle room in the roasting process without making the bird a dessicated mess. 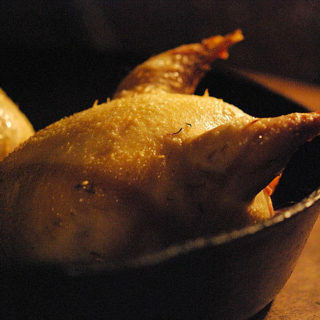 I have another recipe for salt-baked roast partridge, which is pretty spectacular, as well as a summertime recipe for grilled partridges. The sauce I chose to go with this recipe is an apple-based one; I like the combination of "chickeny" birds and apples. You make the sauce at the end, while the chukars are resting, so have everything ready to go before you get to that point. Serve this with polenta or mashed potatoes. Get your tap water as hot as it'll go and pour 4 cups of it over the remaining brine ingredients. Let cool to room temperature. Submerge the birds in the brine, cover and refrigerate for up to 8 hours. Remove the partridges and pat them dry. Let them sit out at room temperature for 20 minutes, while you preheat the oven to 425°F. Stick a quarter of a lemon -- you can use the lemon from the brine -- into each bird. Lightly salt the birds; they'll already be a little salty from the brine, so don't go overboard. Get a cast-iron pan or other oven-proof pan and lay down the celery stalks -- these are to keep the partridges up off the bottom of the pan. Roast in the oven for 25 to 30 minutes. Check for doneness with a thermometer. You want it to be about 155°F. Remove the birds, tent the loosely with foil to rest, then put the pan on the stove. Turn the heat on to medium and remove the celery. Melt the butter in the pan and saute the shallots until the begin to brown. Add the remaining ingredients and stir well to combine. Cook down by half and turn off the heat. Serve the sauce over mashed potatoes or polenta and under the chukars. I prefer a big white wine with this, like a Chardonnay or a white Cotes du Rhone. Very great recipe! I prefer to use Huns, but Chukars work equally well. The apple brandy sauce is very good. The chukars I have are quartered/halved. Can I still use the recipe if they’re not (quite) whole? I figure I could still brine them, and roast them atop some lemons? also, do you have any suggestions on the brine for these birds? will just basic brine (4tbsp salt: 1 quart water) work okay? Ashley: Skin on? Sure, you could roast them as halves. Honestly I would not use this particular recipe for birds in that state. I’d pan roast them.